The Greater Kromme Stewardship (GKS) initiative has achieved a very exciting milestone: the first two Protected Areas were recently declared through the GKS initiative, namely the Kromensee Nature Reserve and the Sand River Private Nature Reserve. The GKS initiative was established by the Wind Energy Collective (a group of like-minded renewable energy developers and wind farms) together with the Kromme Enviro-Trust. The GKS initiative is the first of its kind, and it brings landowners, communities, government and the conservation sector together to join forces to work towards conserving threatened biodiversity and ecosystems of the greater Kromme-Kouga-KouKamma region. 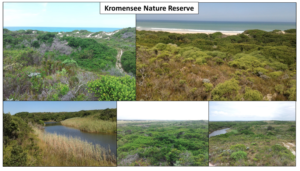 The Sand River Private Nature Reserve and the Kromensee Nature Reserve are just two of many new Protected Areas that will be established through the GKS initiative in the greater Kromme-Kouga-KouKamma region over the coming years. 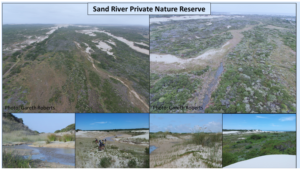 The Sand River Private Nature Reserve contains part of the dynamic Sand River system, as well as one of the finest examples of a Headland Bypass Dune-field. Together, these ecological features create a unique combination of mobile sand dunes, wetland systems and dune streams and pools which creates a diverse range of terrestrial and aquatic habitats. The Sand River Private Nature Reserve also contains endangered and critically endangered vegetation types that form a natural fynbos-thicket mosaic. As a result, the Sand River Private Nature Reserve sustains an extraordinary diversity of threatened species, many of which are unique to the Sand River system and its surrounding areas. Extremely rare species have also been recorded on the Sand River Private Nature Reserve, like the Salt Marsh Gecko (Cryptactites peringueyi) which is only found around the Kromme River area. 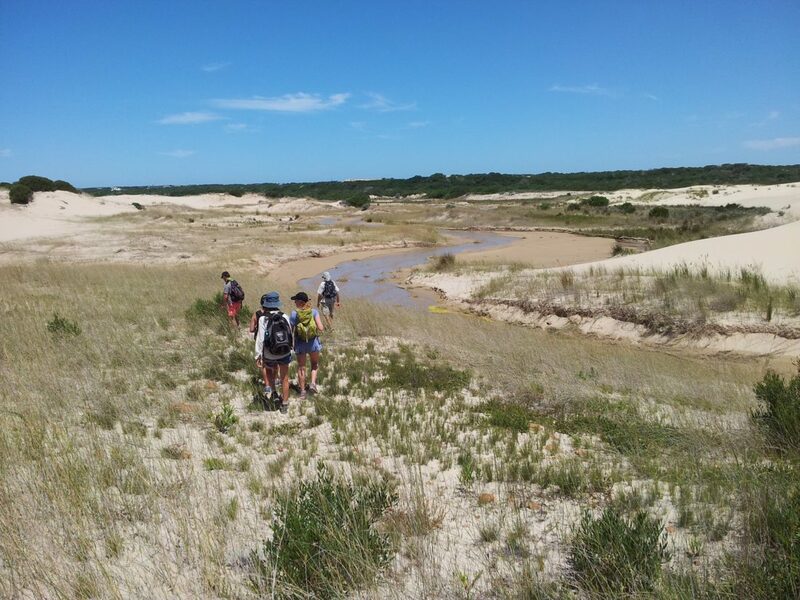 Furthermore, the dune-fields found on the Sand River Private Nature Reserve also contains a number of ancient Khoisan middens and artefacts that are of great archaeological value. The Kromensee Nature Reserve is a ver y diverse area that includes sensitive ecological features such as a network of primary coastal sand dunes, a perennial dune stream, and a pristine coastline that extends all the way from Paradise Beach to the Kromme River estuary. The Kromensee Nature Reserve contains a fynbos-thicket mosaic, known as St Francis Strandveld, which is a critically endangered vegetation type that is unique to the coastal areas around St Francis Bay and Cape St Francis. The Kromensee Nature Reserve is also home to a number of endangered and rare plant species that are endemic to the area (meaning that they only occur in the particular area). Besides being a beautiful coastal reserve, the Kromensee Nature Reserve also plays an important ecological role by helping to regulate coastal processes that is essential for maintaining beaches in the region.